Gilded Butterflies is a two-hander, which takes as its focus the plight of a woman prisoner in the US. Inspired by the experience of a Death Row survivor, it aims, as the programme notes explain, ‘to explore what it means to keep an individual’s soul alive in extremely challenging conditions’. The play’s central character – Maggie – is child-like and obviously mentally fragile, and the nature of her crime is such that we are clearly being asked to think about the question of justice for the mentally ill trapped in the American penal system, as well as the taboos surrounding motherhood, and post-natal depression in particular. The set is stark, consisting of two cell beds, and an occasional grouping of a couple of chairs, and Naomi Baldwin’s sound and lighting design is minimal throughout. Scene changes are signalled by a burst of static white noise, and we occasionally hear (less successfully) the tramp of the prison guards’ feet as they patrol the corridors. The sparsity of the mise-en-scène shines the spotlight on both actors and script, and, despite some excellent work from Francesca McCrohon as Maggie, there was simply not enough here to lift the piece into the realms of truly powerful drama. 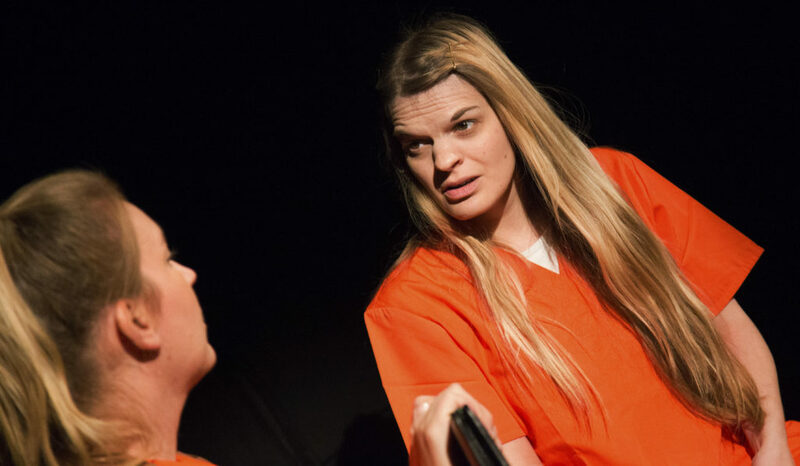 Samantha Pain plays three different characters during the course of the piece – a fellow inmate, Maggie’s lawyer, and Maggie’s sister – but, aside from the fact that each woman wears a different jacket, there is no differentiation between these three individuals, either in vocal quality or physicality. Indeed, the physicality felt very under-developed throughout, and it would be interesting to see how much this piece of theatre could grow with the help of a good movement director in the devising process. As it is, it is unclear why Tormented Casserole (the company) have chosen theatre as the medium for this story, when there is so little theatricality in its realisation; it often feels simply like a radio play on its feet. There are issues with the script too. Aside from a brief moment of vocal frenzy and overlap about half way through the piece, there is precious little pace, tonal or structural variation. There are also moments when the language strays away from the American idiom – no-one in the States would refer to a movie as a film, for example – and these little inconsistencies unfortunately do nothing to help immerse us in this world. Tormented Casserole have made a serious attempt to tackle some important issues here, but, ultimately, Gilded Butterflies needs an injection of theatre to make it worthy of its stage.